In 2005, Holm & Laue revolutionised bucket feeding with the invention of the Milk Taxi. Since then, carrying buckets has been a thing of the past, and every calf receives an optimally stirred mixture at the right temperature. Today, useful extras such as the electric drive, the remote-controlled dosing pump, the option to pasteurise and cool, hot water heating and the drenching probe for cows make the Milk Taxi an indispensable tool on modern dairy farms. 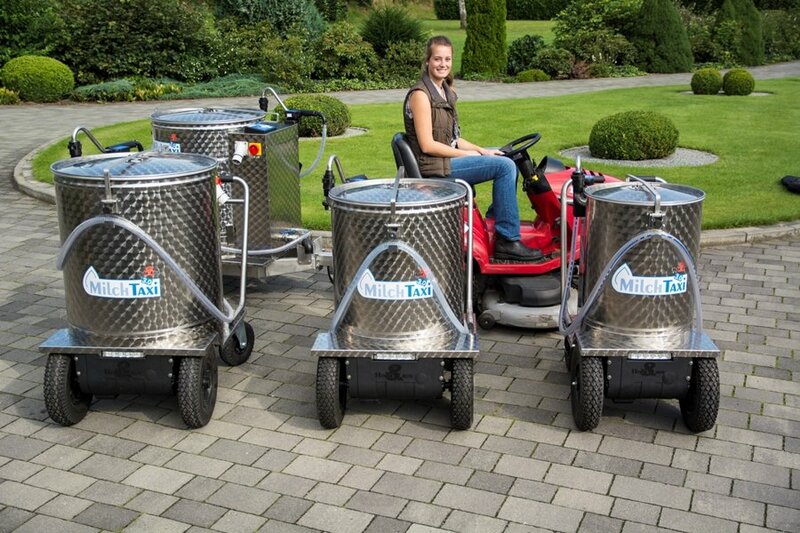 The newest generation, the Milk Taxi 4.0, is revolutionising bucket feeding once again. The Milk Taxi now also enables reliable feeding and weaning based on age, which before was only possible with automatic feeders. It recognises every hutch and calculates the actual correct milk quantity for the calf! The Milk Taxi also knows the amount of milk required for the next feeding, and during the preparation, it already gradually produces the correct mixture, including fortifying whole milk. Mistakes and carelessness are no longer an issue. And the highlight: All of the feeding data can be permanently stored and accessed via tablet or PC at any time. As a result, errors in the feeding process can be localised and rectified immediately. Many of the Milk Taxi’s benefits are not immediately noticeable: The fact that the milk powder is thoroughly stirred in seconds without any clumping or that whole milk is gently heated to make sure it doesn’t burn, surprises everyone who sees the Milk Taxi for the first time. The 250-watt agitator thoroughly stirs any milk replacer in seconds, without any clumping. The agitator also supports the heating process by using short mixing intervals. IMPORTANT: These intervals are adjusted to the amount of milk. Since the agitator is mounted to the base, maximum operational safety is ensured and nothing gets in the way of cleaning the tank. The Milk Taxi operates with a full-surface heating system. Unlike coil heaters, there are no "hotspots" where the milk can burn. The milk is thus quickly heated and the quality is preserved. The display keeps you continuously informed about the current temperature of the milk feed. Many functions, such as the heating and pasteurizing processes, can be programmed with the interval timer. Moreover, the intelligent cooling program only cools when the temperature of the liquid in the tank is too high, and then stops the cooling process in advance before the heating starts, in order to save energy costs. Many mistakes can be made during the preparation. Now, that is a thing of the past, because the new Milk Taxi now guides you step-by-step to the perfect mixture. From now on, you only need to set the desired milk replacer concentration (percentage of dry matter content) and your scoop size one time. Then fill the Milktaxi up to the desired feeding quantity. The Smart-Mix adds the right amount of MR and tells you the required number of scoops for the CMR. Even the solubility of the CMR is taken into account, e.g. 20 kg of CMR dissolved in 100 l of water yield less than 120 l of milk (114 l). The Milk Taxi 4.0 automatically corrects this error. The Milk Taxi automatically detects how much milk or water has already been filled into the tank and continuously shows the current fill level in the display. If the tank of the Milchtaxis is filled with different levels, there will be slight deviations in the dosage quantities when pumping. The level sensor installed with the option Smart-Mix corrects this error automatically. This means that the dosage volume is always accurate, regardless of whether the tank is full or nearly empty. Without Smart Mix you have to set the start times for heating and pasteurizing. Since Smart-Mix can calculate the duration of the heating and pasteurizing phases, you can now conveniently enter the desired feeding time. The Milktaxi then begins the heating program in good time. And if you want to mix whole milk and milk replacer (CMR) together? What if your milk has a dry matter content percentage of 11.3%, but you need a total mixture of 13.5% dry matter content? Then the SmartMIX detects how much whole milk has been poured in and determines how much water and MR has to be added to obtain the required amount of milk in the desired concentration. The stored feeding quantities, the remote control with its up to 10m long hose, and the no-drip dosing device make the feeding process ultra easy. With 9 freely programmable dosing quantities, you can dispense almost any amount of food – without any annoying dripping. Furthermore, the handle is ergonomic and comfortably lightweight. Thanks to the integrated battery, you do not need a power supply to feed the calves. Therefore, particularly if individual calf hutches are used, you are completely free to select any feeding location, and can also feed calves in various areas. With the remote control on the dosing arm, you can easily and conveniently feed calves up to 10 m away from the Milk Taxi, without needing any cables. Of course, the quantities can also be individually adjusted on the dispensing arm. In the Milk Taxi’s display menu, you can monitor the most important work steps using a special statistics function. Every pasteurization cycle, every feeding and every cleaning is documented. A calendar feature also displays this information in a weekly format, thus allowing you to optimally monitor the workflows and processes on your farm. When feeding the calves, you constantly have ask the question: How old is the calf and how much milk does it get? Say goodbye to this task, because the Milk Taxi recognizes every pen, the age of the calf and individually calculates the required feeding quantity! The Milk Taxi uses radio frequency identification to detect each pen as it passes by, and the pen number, number of calves and feeding quantity are indicated in the display. The employee now only has to press the release button and dispense the milk into the bucket. Of course, you can also adjust the quantities individually via the display at any time. Particularly for those farms that have to feed a lot of calves, this function guarantees absolute safety, since every employee always knows how much to feed: a tremendous improvement in working quality, especially when workers alternate or there is employee turnover. Each calf is assigned a feeding curve with feeding and weaning amounts, similar to automatic feeders. Up to 6 individually adjustable feed curves are available. This means that the calves can always get exactly the amount they need for their age, even in individual and group hutches with bucket feeding. Smart ID works for both individual and group pens. In the case of groups of calves, it displays how many calves are in the group and whether they are fed in individual buckets or via "teat bars". In this case as well, the groups of calves can be slowly and gradually weaned according to the curve. The easy and convenient transportation of the milk has been THE decisive contribution to making our customers’ work easier for more than 10 years now. Set on 4 wheels with a low centre of gravity, the Milk Taxi is extremely sturdy and stable. Even if it is driven fast, or on uneven ground and with a full load, it does not tilt over. With the 40 cm front wheels and high ground clearance, unevenness or small obstacles are not an obstacle. Alternatively, the Model 260 l is also available as a trailer with one axle. On all models, the electric drive lets you move forward and in reverse in two adjustable speeds. This not only makes feeding the calves fun, but also puts less strain on your back. You can always see where you are going thanks to the integrated LED headlight – which means you can even feed calves in more remote barns in the evenings. An especially practical feature: The tiltable frame, on which you can transport up to two milk churns. But other things can also be transported just as easily, such as dry feed or tools. The 8-litre colostrum jar is also very practical. When placed into the larger churn filled with warm water, the milk remains at the optimal temperature before it is fed to the calves. Mastitis bacteria also play an important role in disease and illness in the calf stable. Pasteurisation eliminates up to 99.5% of those bacteria and is already a standard part of the calf feeding process on many farms. In the “batch pasteurisation process”, 99.5 % of harmful pathogens are killed over 35 minutes at 63° C. As an alternative to this programme, the Milk Taxi also offers two different heat treatments at 60° C for either 60 or 70 minutes. All start times are freely programmable. Therefore, the milk is already pasteurised when you come into the barn for the morning feeding. The water cooling system is a standard component of the Milk Taxi Pasteuriser. This allows the milk to be stored fresh until it is fed or pasteurized. The automatic cooling program is particularly handy when used with milking robots. It detects the filling level and temperature during the automatic filling process. In addition, the cooling process is programmed in way that optimally utilises the required energy. If you want to cut energy costs and if you have plenty of hot water, then an optional hot water heater reduces your energy consumption, thereby saving on expensive energy costs when heating the milk. Ultimately, it is comfort and convenience that facilitates your work. 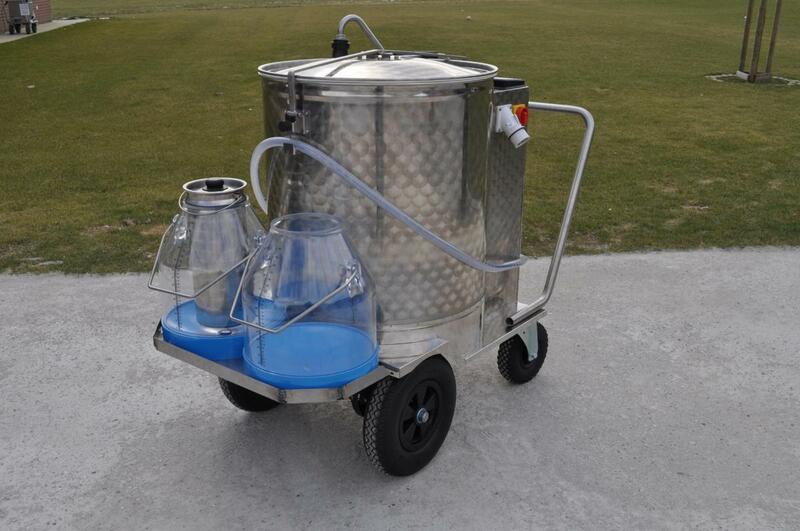 From the user-friendly display and easy cleaning up to the possible uses beyond calf feeding: You will never want to do without your Milk Taxi. Since the lid can be fully opened, the tanks are very easy to clean. The semi-automatic cleaning programme ensures optimal hygiene. Residues, for instance in the pump and hose, can be completely emptied. A supplementary cleaning with the brush improves the results and your Milk Taxi is ready for use again after just a few minutes. You have to attend to so many things every day, the technology just has to work! Therefore, we manufacture all components in the highest quality and thus ensure high reliability. The high-quality stainless steel milk tank is easy to clean and has a long service life. Pumps and motors are protected, and the entire design, without unnecessary cables or cable ties, guarantees easy maintenance and therefore long, problem-free operation. A drenching function for cattle is available as an option. In the Milk Taxi, the drench fluid can be optimally stirred and brought to the right temperature, driven to the cows, and then gently drenched into the rumen via the pump. Instead of struggling with a manual hand pump, the Milk Taxi lets you optimally concentrate on the cow..
*Technical specifications subject to change!